Watch Star Jalsha Live with High Quality On YuppTV. 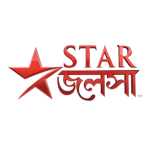 STAR Jalsha is a 24-hour free-to-air channel Bengali general entertainment channel, owned by STAR TV and Fox International Channels, subsidiary of News Corporation. STAR Jalsha was launched on September 8, 2008. It telecasts an array of differentiated programming, fiction, non-fiction programmes, mythology movies and reality shows.